The corridor in dreams. Symbolic meaning and interpretation. What does it mean to dream of going through a very dark corridor? What is the meaning of dreams in which we see many corridors in front of us and we can not decide which corridor to take? See in a dream a very long corridor, short, dark, very dark, with a small light at its end or walking along a corridor and stumbling. Why can we dream of finding ourselves in a long corridor that never ends and be with an unknown person, with a man we do not know in a corridor of our house or our family's house? The corridor is a lane, a passage, a passage that can belong to a hotel, a hospital, a church, a cathedral. We can often dream of doing some work at home and of destroying, demolishing, widening corridors. What does it mean to dream of going through a bottleneck or to dream of opening so many closed doors that we meet in a corridor? What does it mean to dream of a corridor that catches fire? Have you ever dreamed of spying through the keyhole of a door that is in a corridor to see people coming up or down stairs? Dreaming of narrow passages is very widespread and can be very scary, causing fear in the dreamer. Some people dream of a bomb that explodes in a corridor that could be very cumbersome. What kind of numbers of the Neapolitan grimace can we use if we want to play the lottery the moment we dream of running into a corridor to reach a person, to try to win money, following what the guide and the dream book says? "The other night I was locked out in the school corridor. Last night I was with a friend and colleague of mine in a very narrow and narrow corridor. This night I remember dreaming of throwing down the wall of a corridor because I wanted to let in the light of the sun. Last night I was locked out and walked along a really tiny passage". Today we are talking about these dreamy places that can be very cramped and perhaps relate to some choices we have to make in our lives. So to understand the meaning of the corridor in our dreams we have to start from the real meaning and value of a corridor that is simply a place to walk around. Usually it is present in homes and serves to merge various rooms between them and then to move from one room to another room. Many people say they find themselves in a very narrow corridor or very dark, without light. They dream of walking but can not reach the door because maybe they do not see anything or because they encounter an obstacle on their way, on their path. A few years ago a boy dreamed of finding himself in a very dark corridor with a door at the end of it, a closed door from which emerged a priest holding a black umbrella. Even the priest was dressed in a black tunic. In this corridor there was a very weak light that then, at a certain moment, went out. The boy's fear was enormous because that priest came towards him with a very menacing face but completely obscured and not visible. Needless to say, this nightmare suddenly made the boy wake up with a great fear on him and his heart beating very fast. In fact, in most cases this environment is almost always dark and causes feelings of terror. 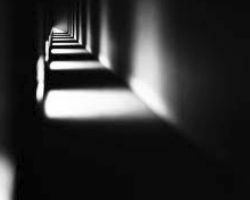 Perhaps this unfounded and relative fear of very dark corridors comes from watching horror movies or thrillers in which many scenes were set in various corridors. But let's try to understand the right meaning of this dreamlike place. When we talked about the house we said that it represents our mind, the rooms of the house are the symbol of some mental areas and therefore some areas of our brain, each of which performs a particular function, the cellar or garage represents our subconscious and everything that connects the various rooms and floors, then corridors, stairs, etc... are the symbol of our mental openings, that is the way we reason and use the potential of our mind. We can see the corridor as the oneiric representation of the different planes of our mind. Obviously dreaming of moving inside a corridor means having a vision of what we are doing in our life that could be a right or wrong thing. If we are doing something that is not correct and does not allow us to be serene with ourselves, then we can dream of walking inside a very dark and light-free corridor. This dreamlike scene signals a period in which we are doing something wrong but above all a period full of confusion. And during our journey we can not find the switch to turn on the light, we can not walk or risk tripping. All these dream situations that also bring feelings of malaise in the dreamer, always represent a very confused mental condition and for this reason we risk making completely wrong decisions in our life. In fact, you must not forget that the corridor is very similar to a road, therefore to the existential path we make in our life and if this route is hindered, if this path is dark, if we find someone who does not allow us to walk freely, then in our life we ? ?will have many obstacles to overcome before we can reach the goal, to achieve success. However, this environment has a strong comparison with the way we reason. Clarity or confusion of ideas and projects are the right words to identify a corridor and its function in the dream world. Unfortunately our mind often does not think in the way we want because it can be manipulated by many external factors and therefore by a situation we are experiencing, by a person or by some feelings that we are experiencing at a certain moment. To understand the situation or the person who does not make us particularly serene, we must remember, of course, every detail of dreams, the emotions and sensations we experience first and then the objects we see and use, the places we are and the people we meet and with whom we speak. For example, we can dream of being inside a house and walking down a corridor with our girlfriend, our husband, our lover. If we have difficulty walking because the light is absent or the person who is with us obstructs our path by blocking us, well then our sentimental situation has something wrong and needs to be fixed. Our mind acknowledges that the relationship of love is in a phase of uncertainty and confusion and transforms this real situation into a dreamlike scene in which the corridor symbolizes precisely our way of thinking that could also be the correct way but which does not find a useful agreement with that of the person we love. Even many people dream of finding themselves in a very long corridor where they see so many doors and have to decide to open and enter a room. Which door to open? In which room to enter? Can we solve this dilemma? If in a dream we are not able to make this decision then our life is at a crossroads, our life has reached a stage in which if we do not make our choice, we risk not evolving, not maturing and going back. Being able to walk easily along a corridor and be able to open a door and enter a room, means being perfectly aware of their qualities that will be used in the right way, thus leading to make the right choices. So you do not have to be too worried when you dream of being in a corridor because it could be very short, free of obstacles, with so much light and the doors of the rooms could even be all open. Mental openness, ease of expression, ability to exploit imagination and potential in the best way. Everything that hinders our journey, during the journey is always the symbol of small or big difficulties that we find in our lives. We conclude this argument by saying that it is essential to remember the place where we observe this corridor. If it is part of our home, then it represents our way of thinking and interacting positively or negatively with the situations of life, if it is instead the corridor, for example, of our office, then at work level our mind is planning positive things or not.